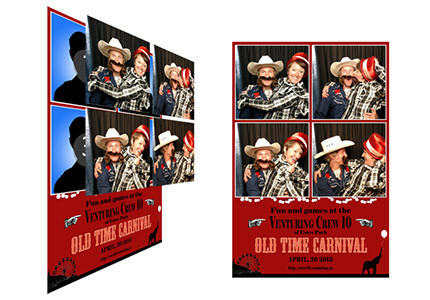 You can create custom, full-screen backgrounds to make your photo booth an integral part of your event. 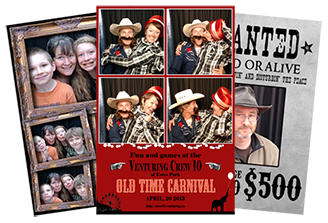 And you can create customized print products to give your guests something to remember. 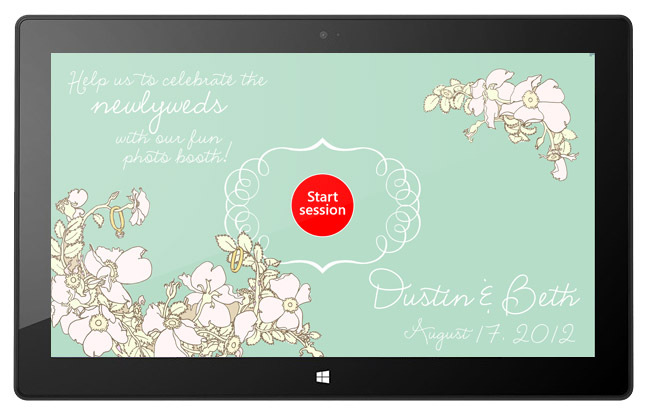 The start screen – This is the screen your guests will see first. You can optionally turn off the app title and even the start button, so you can have creative control over the entire screen surface. 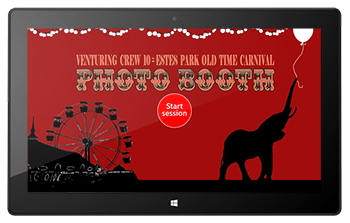 The session screens – These screens are covered with the app’s controls, but with a custom background you can still make all screens harmonize with your event theme. The secondary screen – With the optional multiple monitor feature, you can have a dedicated second monitor or projector to show potential guests what is so exciting about your photo booth. 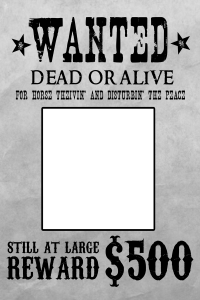 You can specify a custom background just for this screen for maximum advertising potential. While images can be displayed on the secondary screen, the background is an empty canvas for your creativity. Here is a template file for Adobe Photoshop that shows button and title locations. Use it as a guide to see how your design will look in production. NOTE: Make sure your background images match the resolution of your display. If not, they will be stretched to fit and may not look as good as they could. 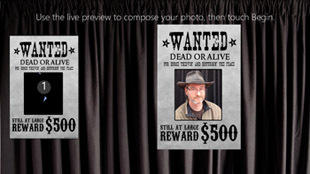 You can create custom background images for use by any photo layout. 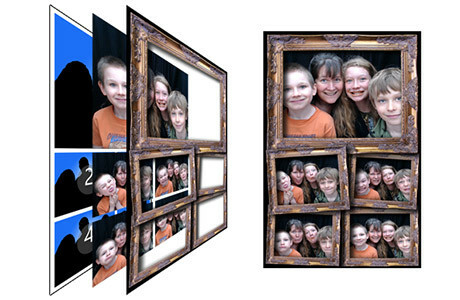 Instant Photo Booth places the photographs on top of your backgrounds to create the final images. The easiest way to get started is to do a sample photo session with the photo layout of your choice. The result will be saved in the Pictures/Instant Photo Booth/Final Images folder. 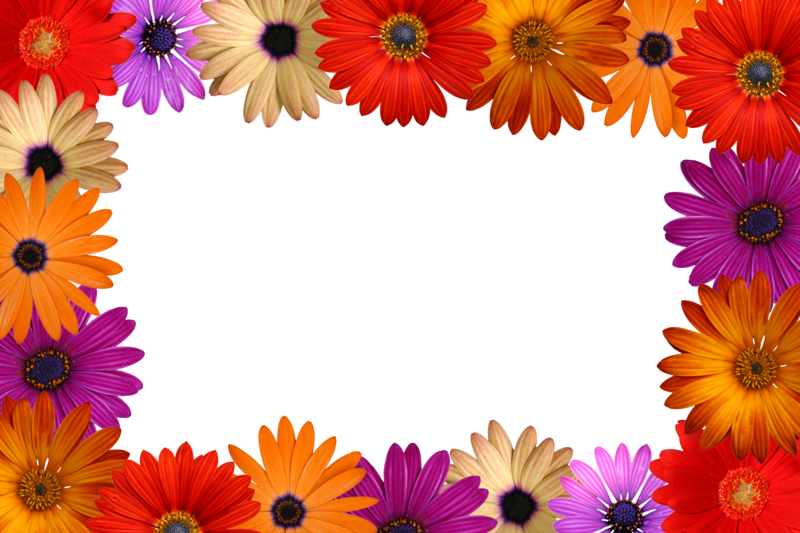 Open the image in your favorite photo editor and use it as a template for your new design. 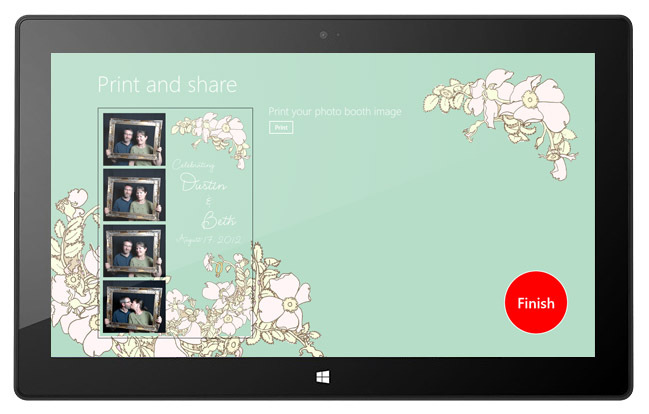 With the photo overlay feature, you can also customize any photo layout. 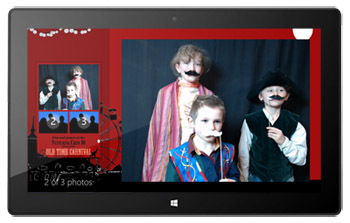 As you can see at left, your overlay is placed on top of the photos to create the final image. There are three types of overlays. 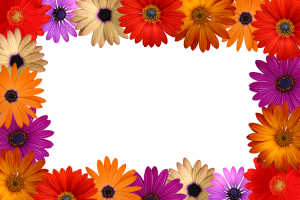 Again, the easiest way to get started making your own overlay image is to do a sample photo session with the layout of your choice. Use single image layouts for live overlays. The result will be saved in the Pictures/Instant Photo Booth/Final Images folder. Open the image in your favorite photo editor and use it as a template for your new design. 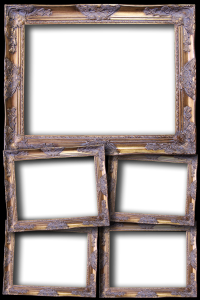 Search the internet for “transparent PNG” to see how to cut transparent holes in your overlay images. 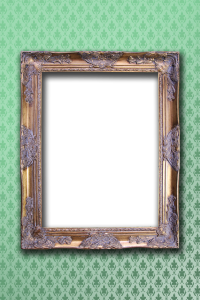 Be sure to save your overlay as a PNG format image. Live overlays are for use with single-image layouts and are placed over the live video preview so your patrons can see themselves in the composition in real time. Any single image photo layout will work with a live overlay. 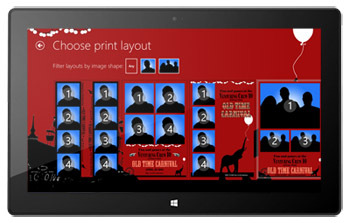 Layout overlays work with multiple image layouts. You can even specify multiple overlays for any layout, in which case the user will be presented with a screen to select which overlay to use. 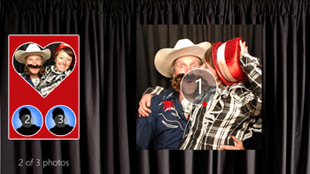 The final overlay is simply an image that gets put on top of all final photo booth images. 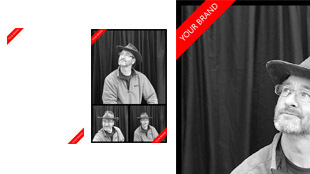 Use this to quickly brand your photo products for a company or event. The example above is a 1200×1800 pixel PNG image where all but the red stripes is transparent. All photo layout customizations are done through the Customize photo layouts page which is accessed via the pencil icon in the menu bar. 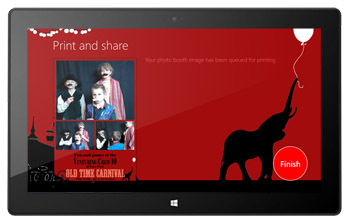 You can adjust the background color, corner shape and radius, image border, and more. 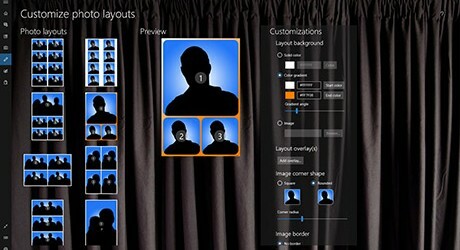 This is also the tool for specifying a custom photo layout background image or overlay. Also, make sure that your images files are not too large. A typical 1200×1800 pixel PNG image is less than 4MB in size. Some image editing programs, such as Microsoft Publisher, can create hugely bloated images of 100MB or more. Save these in the PicturesInstant Photo BoothOverlays folder. 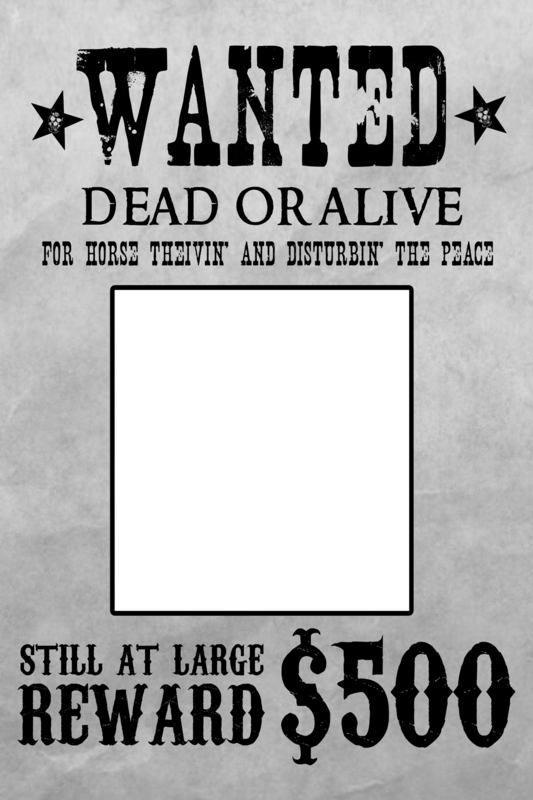 Then match them with the desired single image layout. Save these in the PicturesInstant Photo BoothOverlays folder. 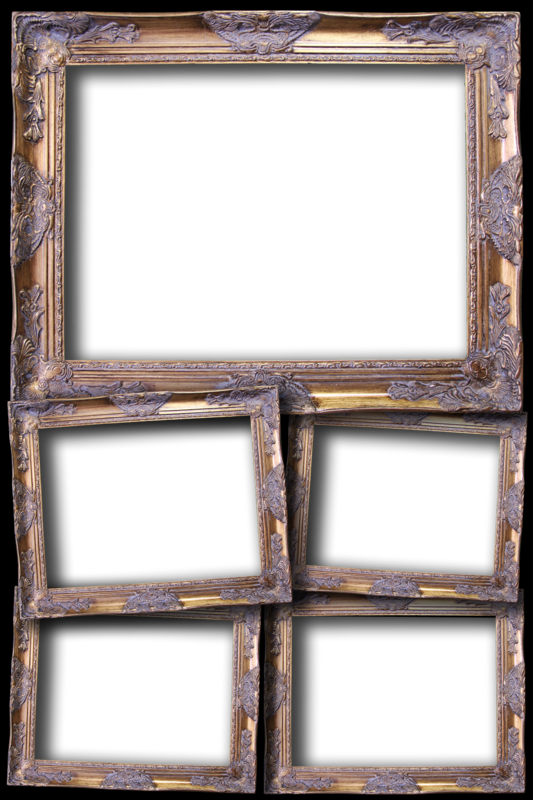 Then, in the customization settings, match the frames overlay with the “FiveWithFavorite” layout. 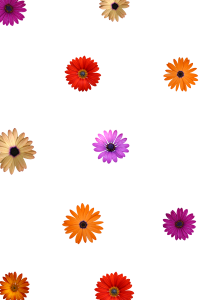 Match the flowers with the “DoubleFourUpSquare” layout. Here is a template file for Adobe Photoshop that demonstrates the simple red stripe final overlay shown above. These four screens represent the custom, simplified workflow for the carnival. These screens show the customizations for the wedding.